We had family visiting from Australia and so we planned a family gathering, only ten of us, at a local gastropub. We arrived at our allotted time for our Sunday lunch and we were shown to a nice quiet corner of the restaurant with a large table. The drinks order was taken and we sat to study the menu which looked fabulous. Our visitors were admiring the sunny Kenilworth vistas and everything was going swimmingly. Two hours later we were exasperated and angry and our family get-together had not turned out as planned. Service is a very personal thing. I’ve written previously about contrasting service experiences in different restaurants. It relies on the recipient as much as the giver. On our previous visit, with just six of us on a Saturday lunchtime we received absolutely exceptional service – so good that we wanted to come again and so good that I went on the website to commend our waitress. She anticipated our needs and turned what could have been a tricky situation into an awesome experience. We arrived with no booking on a Summer Saturday lunchtime. We were happy to sit outside and enjoy the weather. The waitress was attentive and, although the kitchen was busy, she kept us informed and kept things moving. As we were nearing the end of lunch the weather turned. She initially brought some blankets out which turned out to be just what was needed – a nice touch we thought. Some time later the weather really turned and, just as it was about to rain, she ushered us inside to a table she had already prepared. Compare this with our Sunday lunch. The drinks order was taken and then nothing happened. We finished our drinks and after half an hour had to summon a waitress to take our order. It was another half an hour before the starters arrived and then a long forty minutes before the mains had to be chased up. 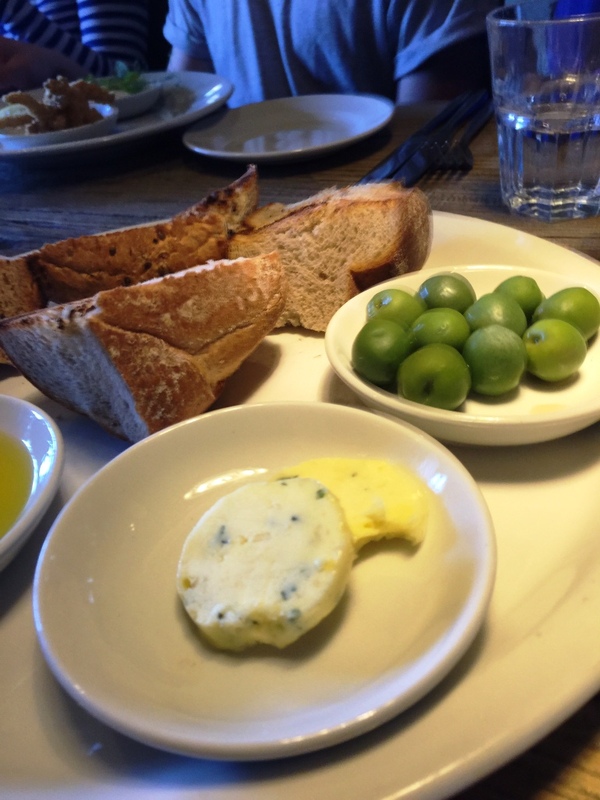 Those olives and bread sat in front of me for an awfully long time. Seriously, how much preparation does bread and olives take? We were given one bottle of water between ten of us and it was never refilled unless we chased. The Sunday roast arrived without the vegetables and by the time they arrived (after being chased) it was too late. By this time the children were very impatient in the group and we were starting to be fed up with being ignored. The excuse we got was that the kitchen was busy because there were people ordering food in the garden as the weather was unexpectedly good! More fools us for thinking ahead and booking. What should the restaurant have done? I think they should certainly not take bookings if they aren’t able to guarantee service. The waitress should have recognised that a large table with children needs more pacy service. The newcomers in the garden should have been the ones to have a long wait – they wouldn’t have minded as long as they had been warned. When the first mistakes were made, the staff should have concentrated to make sure more didn’t happen. They should have apologised and maybe offered another round of bread and olives or some other nibbles. They should certainly have been around to take some drinks orders. And the food? Really, it wasn’t the point – this was a family occasion not Masterchef. Maybe I wouldn’t have noticed the miserly portion of roast beef (although it was well cooked) or the truly cardboard Yorkshire puddings which Aunty Ruby would have thrown away. Maybe I just wouldn’t have said anything because it was a family occasion. From thinking this was a well-run establishment I now think that we had a superb waitress the first time who works for a greedy employer. We won’t be back any time soon. This entry was posted in Articles, Opinion and tagged attentive, family meal, gastropub, Kenilworth, olives, Queen and Castle, roast beef, Service, Sunday lunch, Yorkshire pudding. Bookmark the permalink.